December 3, 2008- In recognition of 2009 as the "Year of Reconciliation",UFMEP held an event on December 3, 2008 to explore this theme and promote a discussion on human commonality through spirituality and consciousness. 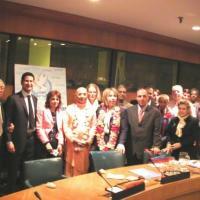 November 12-13, 2008- The two-day Nov. 12-13, 2008 "Culture of Peace" gathering convened on the initiative of King Abdullah of Saudi Arabia, who called for mutual understanding through dialogue among various faiths, cultures, and civilizations. King Abdullah, who in an opening speech on Wednesday denounced terrorism as the enemy of all religions, initiated the meeting attended by leaders and diplomats from over 70 countries. "What are some Dimensions of the Buddhist and Muslim and Muslim understanding of peace that can be contributive to our current global situation? What do women's perspectives have to bear on these issues? 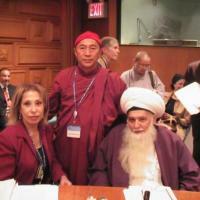 What are Buddhist and Muslim contributions to the understanding and active promulgation of Human Rights in the world today?" February 25, 2008, This side event for the 52nd session of the Commission on the Status of Women (CSW) was moderated by UFMEP President, Mrs. Salwa Kader and focused on the media s crucial role and responsibility in communicating information. 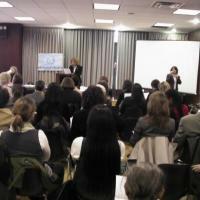 February 26, 2008, The priority theme for the CSW 52nd session was "Financing for gender equality and the empowerment of women." President of UFMEP, Mrs. Salwa Kader, moderated this event and dedicated her focus for this theme on women in Middle Eastern and North African governments. The panel discussion focused on the involvement of women in government and political processes and how they can help incorporate a gendered perspective into policies and decisions. February 25, 2008- This side event for the 52nd session of the Commission on the Status of Women (CSW) was moderated by UFMEP President, Mrs. Salwa Kader and focused on the mediaâ€™s crucial role and responsibility in communicating information.